The University of Oregon‘s football program has made a name for itself over the years by producing players with dazzling speed and athleticism. However, last Friday, Oregon proved that there’s more to its program than athletically talented running backs and quarterbacks. 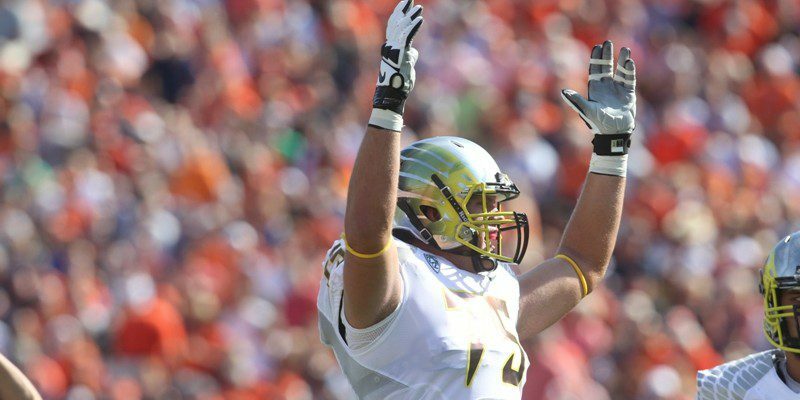 Many prospects have already showcased their abilities to NFL scouts during the past week, but one former Duck earned their attention in a different way. Offensive line prospect and former Oregon Duck Jake Fisher convinced scouts that he has much more to offer other than his size. Scouts already view Fisher as a favorable pick in the draft, standing at 6-foot-6, and weighing in at 306 pounds. Fisher impressed during his workouts with a display of athleticism at the NFL Combine last Friday in Indianapolis. The big man made his case by clocking in a 40-yard dash time of 5.01 seconds, which was the second-fastest time among offensive linemen. To add to his remarkable 40-yard dash time, he finished with the fastest 20-yard shuttle run time at 4.33 seconds. If those performances weren’t enough to impress scouts, he went on to finish first in his group with a time of 7.25 seconds in the 3-cone drill as well. Aside from his speed, Fisher was able to tie for the second-best vertical jump at 32.5 inches among offensive linemen. Fisher’s performance in the combine that showcased his versatility likely increased his draft stock. Even though he has already gained the respect of scouts, Fisher will have another chance to raise his draft stock even higher at Oregon’s upcoming pro day prior to the draft.